OK, I will be the first one to admit that this recipe is not going to win any awards for originality or creativity, but it’s good. Really good. And simple. AND healthy. How often do you get to say all of that about one dish? I must have some addiction to carotene because I love most orange hued vegetables: carrots, sweet potatoes and canned pumpkin are in my fridge and pantry year round. In fact, pumpkin is one of the few items I buy canned and find it just as good. Unfortunately, that same idea does not translate to other squashes. Acorn, spaghetti, and butternut squashes only seem really tasty in the cooler months. I’ve tried frozen and canned but don’t care for either. You can also find squash all through the spring and summer, but like most produce, they definitely lack something when harvested out of season. For that reason, I try to make the best use of them while I can get them. This soup of a great, weeknight meal. One pot, items I already have on hand, 45 minutes, pair it with some bread, and you’re done. I use chicken stock when I prepare it, but swap that out for vegetable stock and you have a vegan dish that satisfies everyone. One of the pieces of kitchen equipment that I cannot live without anymore is my immersion blender. I use it constantly, and it is perfect to make this into a smooth, velvety soup that seems quite elegant. If you do not have an immersion blender, go buy one. But until then, you can work in batches and cream this soup in a blender – no one will be any the wiser. The real trick to slightly sweet soups like this is to balance it with some acid. It changes everything. The best acid to use for orange vegetables? Cider vinegar, of course. If you don’t believe me, sample it without the vinegar and then add it. You will be amazed at the difference. But too much can be as bad as not enough, so be careful. So if you’re looking for inventive, haute cuisine, you will have to keep looking. But if you are looking for hearty, simple, and fantastic – you’ve come to the right place. Not fancy, but fantastic. Not stylish but simple to make. For omnivores and vegans alike. Perfect for a light weeknight meal. Preheat a large soup pot over medium high heat. Add olive oil, celery, red pepper flakes, pinch each of salt & pepper. Add butternut squash, bay leaves, cinnamon, chicken stock, and another pinch of salt & pepper. Bring to a simmer, cover, and let cook for 40 minutes. Once the soup is cooked, remove bay leaves. Blend until smooth using an immersion blender. Alternatively, puree soup in a blender, working in batches. When soup is smooth, stir in cider vinegar and adjust seasonings to taste. Optional: for a silkier (and more decadent) soup, stir in ½ C heavy cream at the end. Garnish with fresh dill, if desired. 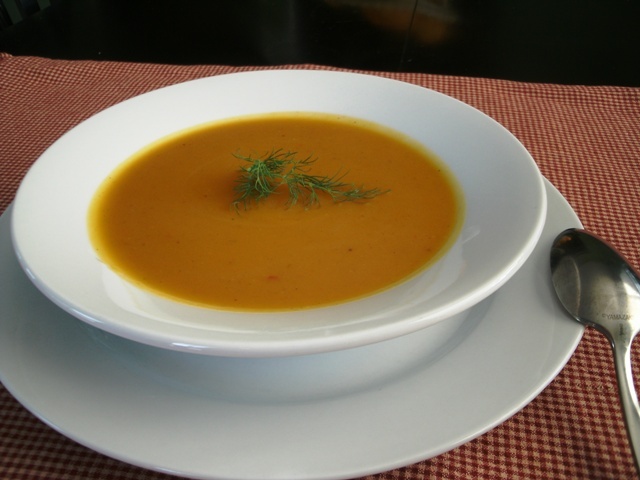 This entry was posted in Cooking and tagged butternut, dinner, easy, inexpensive, soup, vegan, vegetable, vegetarian. Bookmark the permalink.